The Bananasana or the Banana Pose is a fun way to open your entire side-body, from the top of your ribs to your iliotibial bands. It is an especially nice pose if you have tight IT bands from running or other physical activity. 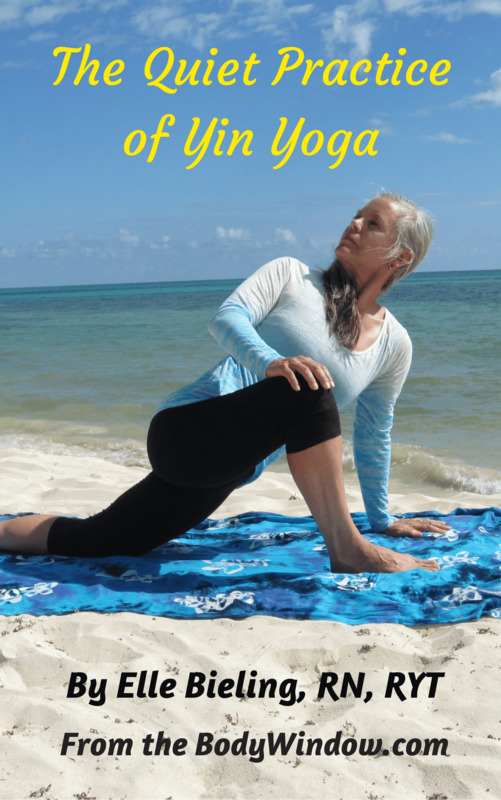 The practice of Yin Yoga takes you on an inward journey, that only you can take. It is learning to be present with what is, all the thoughts, feelings and sensations in your body, watching them as they arise, only noticing, holding still and not acting on them. The Bananasana is a very fun name for some very serious work on your side body. At first I didn't understand this pose, and not all Yin Yoga teachers teach it. It seems silly, at first, but if done properly, this pose can be very, very therapeutic, especially if you are a runner, and have tight IT bands. The Banana Pose begins by lying on the ground, on your back. Reach upward with your arms, pointing your fingers together overhead, in the prayer position as shown in the first picture, below. You may use this starting position as a nice Yang stretch, extending your spine upward from your core, and downward through your feet, in the opposite direction. This is a wonderful stretch, all by itself, but is an active, Yang pose, not a Yin one! 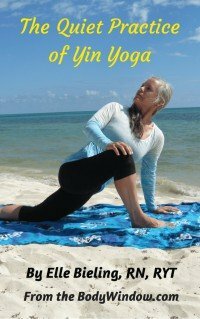 If you don't understand the difference between a Yin and a Yang practice, please see my article called What is Yin Yoga? 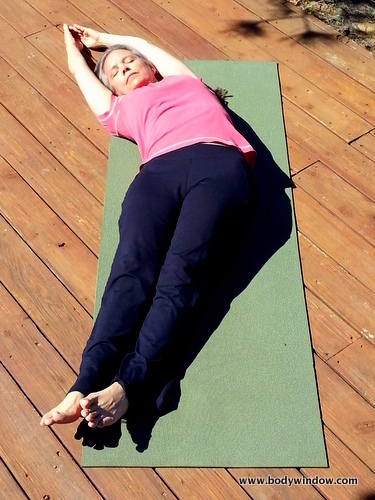 When you feel complete in this initial stretch, root your hips and legs into the ground. 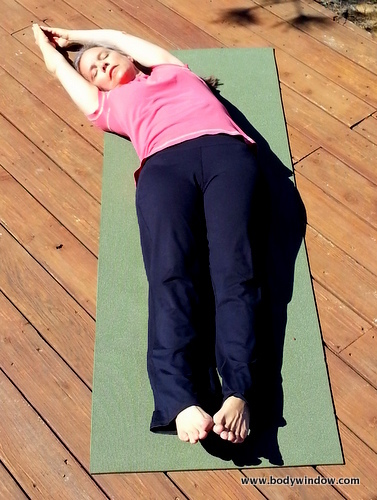 On an inhale, lift your torso up off the ground and bend at the waist to your right. You want to ensure that your hips and legs do not move, but stand straight and strong into the ground. Exhale and root down again through the hips. Now, with your hips and shoulders rooted, inhale and lift your legs and move them also to your right, keeping your feet together, if you can and forming the position like a banana or C-shape. As you exhale, and continue to breathe deeply, feel the sweet and wonderful stretch that is occurring in your left side ribs, hips and left iliotibial band. Breathe deeply into the stretch, settling into the pose for 3-5 minutes. Calm your mind and your body as you sink ever deeper, the longer you hold this pose. Sometimes, if I am not too stiff, I will even intensify this stretch by taking my right ankle and crossing it over the left, and slightly pull my left leg more to the right. This action turns up the stretch on my left side-body. You may try this as well, if your heart desires. Try to stay focused and not move during the duration of this pose. Focus on your steady breath, and inhale deeply thru belly breathing. As you exhale, send your breath and energy to your side, where you feel the tugging the most. 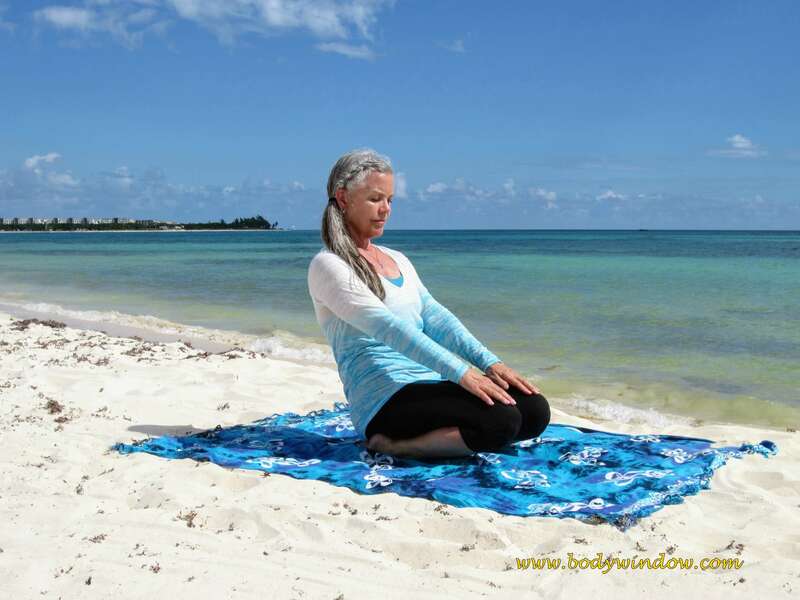 Notice what happens over time, as you release into the breath and into this pose. When you have stayed in the Bananasana for 3-5 minutes, slowly come back to the center again, and do another vertical stretch. Repeat the pose on the other side. The Banana Pose opens your ribs and chest and improves the circulation there, as your Lung Meridians open, improving your fourth chakra balance. It also opens the hips through the iliotibial bands, and improves your second chakra energy. 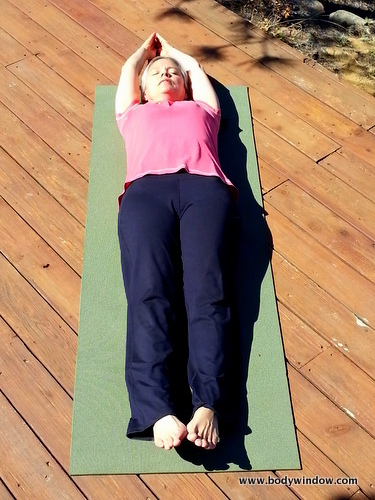 This is a wonderfully revitalizing pose and will aid you in your Yin practice to open your body's energy systems. It is one of the easier, and more pleasant poses, as I am sure you will agree! Please take the 6-10 minutes or so, to improve your own opening process, as you do the Bananasana and find Peace and Healing for your body-mind-soul!